Soft touches in kitchen remodeling: Colonial White Granite White Cabinets Backsplash Ideas. Since the Kashmir White Granite quarries are still closed, Colonial White is being very trendy. The similarity in Kashmir White Granite and Colonial White Granite brings the almost same backsplash ideas when white tone kitchen cabinets are picked. I would like to mention, the material and the characteristics of the backsplash, the color and stain of the white or cream cabinets in this article. I will show some Kashmir White Granite White Cabinets Backsplash ideas and mostly Colonial White Granite White Cabinet Backsplash Ideas in pictures. When you decide the to go for Colonial White Granite White Cabinets Backsplash Ideas, your color pallet will be filled with pastel tones. The backsplash colors are white, off white, soft beiges and browns. If you like the use some opposite color, black can be recommended. 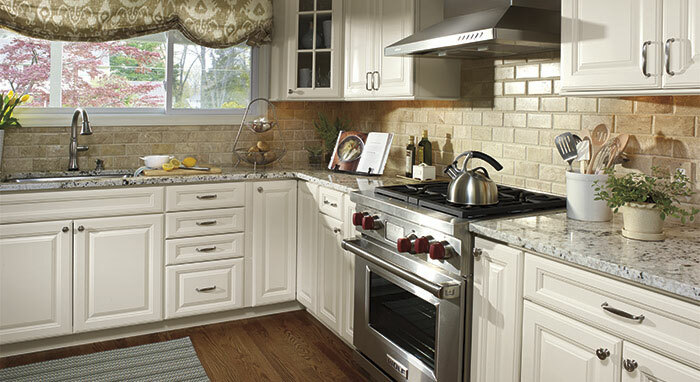 Backsplash color selection is very easy for both Colonial White Granite and Kashmir White Granite in white kitchens. Alluring Replacement: Colonial White Granite Countertop article can be very helpful your kitchen remodeling ideas. The material for the backsplash can be ceramic, glass, and travertine. The type of the backsplash tile would be subway, matchstick, novelty and mosaic. Picture Credit: Linnane Homes. Colonial White with white ceramic subway backsplash and two tone cabinets. Perimeter cabinets are alabaster stain,island is stone stain by Noncraftcabinetry . Light oak flooring with Jacobean stain give a perfect contrast. Recess lights, pendants, under cabinet lights and stainless steel appliances give a nice shiny polish to this kithen. Very well used design elements. Picture Credit: 400 West Design. Rich taste in your dream kitchen. Colonial White Granite with white Walker Zenger Backsplash and White cabinets and Espresso hardwood flooring. I am still collecting the details about the colors and style for backsplash, cabinets and flooring for you. Picture Credit:Studio212interiors. Kashmir White Granite with glass backsplash and off white cabinets. The backsplash would be either Tuscany pattern super white, Vetro by Casa Dolce Casa in Matte Bianco or Glace by Ann Sacks. The under cabinet lights are LED strip lighting and cabinet color is from Benjamin Moore Dove White. Meticulous design with perfect result. Kashmir White Granite with Maple Paint Cream Cabinets and Mixed Match Matchstick Backsplash Glass and Stone Mosaic. If you would like to take your turn and drop a comment about Colonial White Granite White Cabinets Backsplash Ideas, please do not hesitate. Thank you for your collaboration.